Search for the best flight prices from Manchester to Ilha Do Sal. Compare prices, book today and save money with Manchester Airport. This tiny island is roughly 375 miles off the coast of West Africa in the Atlantic Ocean. Sal is one of the Cape Verde’s Barlavento – or windward – islands, and is opening up to visitors from abroad (imagine the Canary Islands as they might have been 40 years ago). Go now, beat the rush, and do your very own bit of pioneering. You’ll have the stunning white sandy beaches pretty much to yourself. Sun-drenched, sandy Sal is the perfect place to wind down. For a simple, no-frills apartment-style stay an easy stroll from the beach, there’s Aquamarina Suites (Entrada Santa Maria, 1234 Santa Maria), as well as Djadsal Moradias Tropical Resort (Djadsal Moradias, 4111 Santa Maria). Hotel Dunas de Sal (21100 Santa Maria) is a modern hotel sat near the beach with relaxing facilities such as two pools and a spa – and a gym if you can muster the energy. For a basic but comfortable holiday home beside the sea, there’s Villa do Mar (Rua de Fabrica, 1234 Santa Maria) with three bedrooms, private beach area, garden and terrace. Shopping on Sal is pretty small scale, but you can pick up most essentials. In Espargos, the capital city, find essential services such as banks, a health centre and the main post office, as well as internet cafés and general stores. Souvenir shops can be found on the old harbour quay in Santa Maria, as well as a few shops selling food produce. Sal’s street vendors sell all sorts of foodie bits – it can be worth trying a gentle and friendly haggle as you may well find them attempting to sell tourists things at a higher price. Beachside restaurants offer picturesque dining in Santa Maria, with plates of glisteningly sea-fresh fish enticing plenty of diners. The square in town also has some good dining options, bars and music. Ocean Café (Rua 15 Agosto, Praça Central, Santa Maria) is popular with the international crowd, serving alcoholic drinks, coffees, snacks and larger plates. Things often liven up with a spot of music. Fill up on fresh seafood at Le Prive (20 Rue du 15 Aout), while enjoy a warm Irish welcome and sports screenings at Tam Tam, Bar & Restaurant (Rua Amilcar Cabral, Santa Maria) – a relaxed bar run by a welcoming Irish couple. The New Year is brought in with much celebration and cheer across Cape Verde. On Sal, head to Santa Maria for some of the liveliest celebrations. Catch carnival fever with a host of parties, housed everywhere from hotels and bars to the sports ground and the streets. The main parade in Santa Maria on Ilha Do Sal features infectious drumming and dancing, skimpy and glitzy costumes, and everyone having a fine old time in the island’s famously liberal amounts of sunshine. 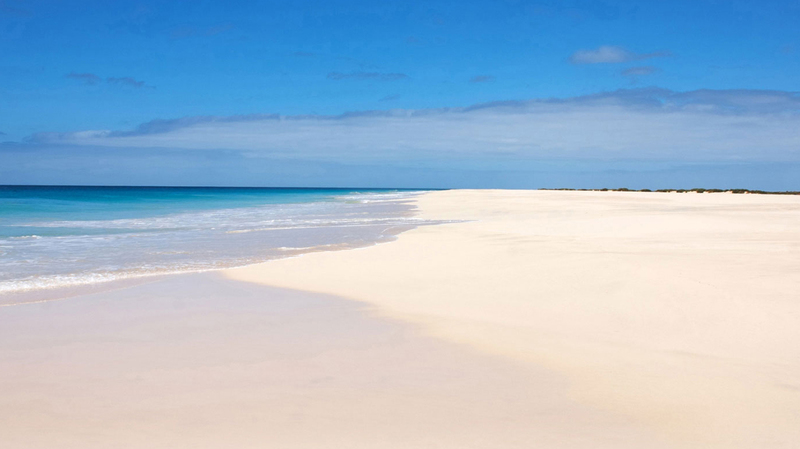 Hop over to neighbouring Boa Vista Island for activities such as horse and boat racing, football and dancing. There is also a sacred mass, preceded by a ceremony of boats in the Bay of Sal Rei. Boats run between Sal and Boa Vista, and there is also a catamaran. A music festival filled with local musicians takes over the beach, accompanied by swimming contests and more, at this August event.